The almost indestructible 'Glow in the Dark' silicone ice bong is ideal for on the go, as it is flexible and very light weight. As a special highlight, it has a plateau in the tube where ice cubes can be placed on. 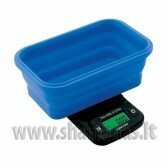 Of course, the silicone is food-safe as well as cold and heat resistant. The handmade glass bowl for dry herbs does not need a screen and is inserted in an adapter with diffuser slits. So there is enough turbulence for cooling and filtering the steam in this silicone pipe. As a special effect, the water pipe colour glows in the dark. The ice bong by 'Black Leaf' gives the most frozen hit ever without melting away! 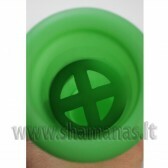 Just fill water in the space between the double-walled pipe made of food-safe silicone and close the opening with the plug. Freeze the water pipe afterwards. The result is a bong with walls of ice which guarantees ice-cold smoking pleasure. The ice pipe can be frozen and used repeatedly. 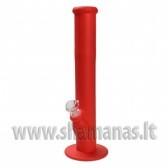 Unfilled, the silicone pipe is very light and easy to transport. Additionally, apart from the downpipe and bowl made of glass it is almost unbreakable.